"My action station was in the conning tower, together with the Torpedo Officer, the Assistant Navigating Officer, the Admiral's Secretary, Chief Petty Officer Fitzgerald, the Chief Quartermaster and several seamen ratings tending the voice pipes etc. Admiral Packenham, with his Flag Lieutenant was on the upper bridge, where they remained throughout the action, together with our captain, Captain John Green, who was wearing the Maori rush kilt or war mat, called a piu-piu, which had been given to the ship by a Maori Chief during the ship's cruise around the world in 1913-14, with the injunction that it was always to be worn by the captain of the New Zealand when in action. At about 3.50, the action was commenced by both side opening fire almost simultaneously. We had only been in action a few minutes, when the Admiral's Secretary came across to where the Torpedo Officer was stationed in the conning tower and drew his attention to the Indefatigable. He crossed at once to the starboard side and laid his glasses on her. 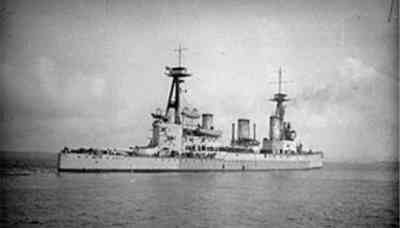 She had been hit aft, apparently by the mainmast, and a good deal of smoke was coming from her superstructure aft, but there were no flames visible. He thought it was only her boom boats burning. We were altering course to port at the time, and apparently her steering gear was damaged as she did not follow round in our wake, but held on until she was about 500 yards on our starboard quarter, in full view from the conning tower. Whilst he was still looking at her through his glasses she was hit by two shells, one on the foc'sle and one on the fore turret. Both shells appeared to explode on impact. Then there was an interval of about 30 seconds, during which there was absolutely no sign of fire or flame or smoke, except the little actually formed by the burst of the two shells, which was not considerable. At the end of the interval of about 30 seconds the ship completely blew up, commencing apparently from for'ard. The main explosion started with sheets of flame, followed immediately by a dense, dark smoke which obscured the ship from view. All sorts of stuff was thrown high into the air - a 50-foot steam picket boat, for example, being blown about 200 feet, apparently intact. The loss of Indefatigable, our next astern, happened so suddenly that, almost before we realised she had gone, out attention was entirely absorbed in the very fierce battle that was now progressing all round us."